Several studies have linked the cleanliness of the workplace to improved occupant health and increased productivity. 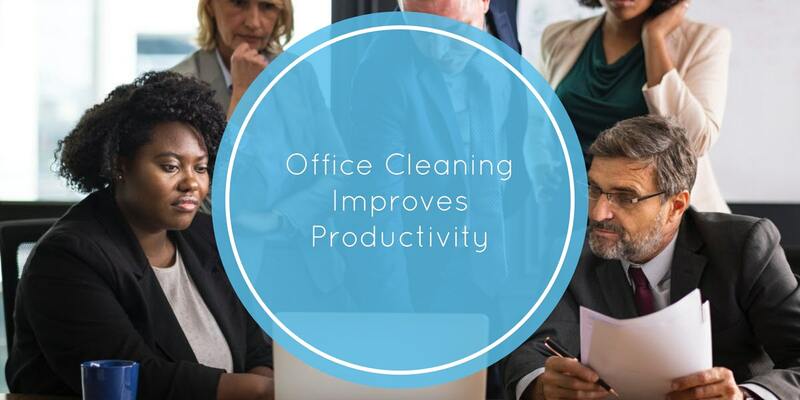 From first impressions to employee health and morale--cleaner offices translate into increased profit margins for businesses, and better grades for students. A messy office can create an unhealthy atmosphere in the workplace. It will also hamper productivity because the employees won't be happy. A messy work environment can mean employees are routinely compromising on the quality of work. [...] if the carpets are old and their colors have faded because of use and dirt, it could create a negative impression on prospective clients. However, while new or clean flooring, decluttered workspaces, and modern colors with biophilic design can have a positive impact--by themselves, they are insufficient. A facility must maintain a high level of cleanliness to stave off ever-present germs and disease while combatting ongoing challenges with indoor air quality (IAQ), typically exacerbated by volatile organic compounds (VOCs) commonly found in conventional chemical cleaning products. Nearly every business, large and small, struggles with the dichotomy of managing occupant time to ensure maximum productivity while maintaining a functioning work environment, investing in occupant health and productivity while meeting financial bottom lines, and providing a safe and healthy work environment without crossing inappropriate lines regarding occupant hygiene. Sweeping changes throughout a school or business are disruptive and expensive, but ignoring the issues or worse, taking half-measures, maybe worse. To balance this dichotomy, and lead from the from the front while supporting your teams and students, we recommend focusing on the following. The lobby room floor is one of the first places people notice when walking into your facility, and first impressions count. A clean, well-maintained entryway not only provides visitors with a positive outlook on your organization, but protects them from dangerous and, oft times expensive, slip-and-fall accidents. Additionally, carpeting has been shown to hold up to one kilogram of dirt per square foot, which can lead to increased challenges with bacteria and severely impact the quality of indoor air--contributing to respiratory issues and the dreaded sick building syndrome. Cleaning the sidewalk and parking lot of dirt and debris. Placement and maintenance of high-performance walkway mats. Quarterly or seasonal stripping, waxing, and buffing hard floors in alignment with the foot traffic in and out of your facility. Clutter is a productivity-killing distraction that is costing your business a fortune and your students higher grades. A recent study conducted by Harvard University tested this theory by placing students in either a tidy or cluttered office and then moved into a room to attempt to solve an impossible puzzle to see how long it would take each volunteer to give up. On average, the students who spent time in the tidy office lasted approximately 18.5 minutes, while the students who were placed in the cluttered office lasted around 11 minutes before quitting. [...] the messy environment posed a threat to people's sense of personal control that diminished their mental resources, which in turn harmed their self-regulation abilities. [...] untidy workplaces can undermine people's persistence in completing tasks, therefore affecting productivity. Cleaning and disinfecting with a health first approach is a critical component of a productive workplace and classroom for several reasons. Statistically, occupants do not wash their hands appropriately, for long enough, with soap, or at all, contributing to the constant spread of disease-causing germs and bacteria that have been shown to live for days, if not longer, on several commonly touched hot spots, such as computer equipment, vending machines, and pretty much everywhere in lunch and break rooms. Combined with the inadvisable habit of eating at one's desk, these germs are consumed, leading to a host of productivity-killing illnesses and absences. It is estimated that the typical employee is absent from work approximately nine days per year due to illness, much of it attributed to poor personal hygiene in the office, leading to billions in lost profits, or directly to preventable health care costs. Promoting workplace and classroom hygiene that emphasizes the importance of handwashing and wiping down workspaces and break areas, businesses can staunch the flow of their financial losses and increase occupant wellbeing, happiness, and productivity. Combined with regular cleaning and disinfection services throughout the facility, germs, and bacteria can be reduced to an ineffective minimum and ensure your organization operates at peak capacity throughout the year. A cluttered, shabby, poorly cleaned office will inevitably lead to employee disengagement, one of the primary and most expensive challenges facing U.S. businesses. A disengaging atmosphere can lead to poor performance from good employees. In the U.S. alone, employee disengagement is costing companies over $500 billion dollars every year, as it affects productivity, wellness and revenue. A cost-effective solution is to outsource your organizations regular, and special cleaning services needs to an experienced local vendor with a track record for high-performance and customer satisfaction.